I’m afraid to say that Outpost: Black Sun, the zombie nazi fest from director Steve Barker, that he co-wrote with Rae Brunton, and which stars Richard Coyle and Catherine Steadman, left me distinctly cold. It’s quite frankly boring and, once it had finished, I managed to black it from my mind completely. 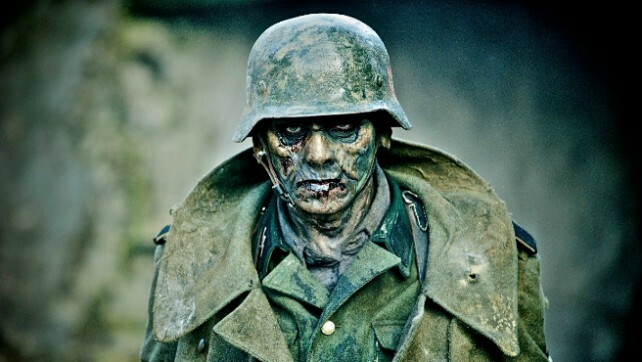 Towards the end of WW2, a German scientist called Klausener (David Gant) had been working on the creation of a Nazi army of zombi soldiers. Jump to today and a feisty young investigator called Helena (Steadman) is searching for the infamous war-criminal Klausener whom she believes is still alive. By chance she finds herself in the same area of Eastern Europe as Wallace (Coyle), a man who has been on the trail of the Nazis for years. Reluctantly they pull resources and, with the help of a Special Forces Unit, the two unlikely comrades venture deep into no-mans land where they discover something more evil than even they imagined – an army of undead Nazis created with the sole purpose of the establishment of a 4th Reich which will then be unleashed upon an unsuspecting world. Reading my opening paragraph some will say I should refrain from making make such blatant statements – unless of course I can back them up. Well, I’m glad (or rather, sad) to say I can. This film IS boring with nothing of any interest or the slightest bit frightening happening – at least nothing that I could see. Still as most of the action took place within a warren of dimly lit tunnels, which seemed to run either into each-other or into dead-end rooms, it was extremely hard to tell what was going on half the time. The living characters are also disappointing, being almost as lifeless as the zombi hoards they’re fighting, leaving you the viewer not really caring one way or the other whether they survive or not. The only vaguely impressive bit is the central power room from which all the undead hokum is radiating. However one effective scene does not a good film make and, on the strength of Outpost: Black Sun, it appears to be time to let the sun set on this particular niche area of zombie horror.